1. The Internet: are you being moved or is it your move? What do you think of the title of this paper? Do you have the idea that I am reducing the Internet to a mere search-function? Or that I am inviting you to see the Internet as a tool with which to do thorough research? Probably, you react on the basis of the values, the perspectives from which you usually react. Your frame of reference and set of cognitions determines how you see the world. Surely, we use our brains to see, not our eyes. You are what you see. Optimists always see opportunities. Pessimists always see dangers. In my opinion, the Internet adds another dimension to this. I think that the Internet contains such an astonishing amount of information that there is no other way than to be more aware of yourself and your own values: no life without roots, no growth without roots. Otherwise, you will be flushed away by the Internet and be moved, instead of giving shape to your own life. Where Web 1.0 could be seen as a large database with Google as its market-hit, Web 2.0 and, in the near future a semantic web, will allow social interaction to play a role and will stimulate this role on a – mobile or not – smart and interactive way . I will sketch what I see happening in that digital world from different points of view and I invite you to develop your own opinions. I often use Dutch references. The message is not that the Netherlands are ‘special’ or ‘unique’. I’m convinced that in other regions the same trends apply and it is easy for you, dear reader, to find references for your own region. I think that in the future, the impact of the changes which happen as a consequence of the digitization of information streams will be more intrusive than that we are already realizing they are. Just look at the business world, the way in which markets and consumers segment, the way we do politics, how we shape organizations, how civil journalism adds content to the newspaper, the manner in which criminals are caught and, for instance, how people manage to find each other. And how we, in society, try to find a new balance between social hypochondria and new ways of leadership. It appears that a Government 2.0 is developing in which the political power is organized according to a different fashion and in which it utilizes a more bottom-up approach. The obvious power of governments – that is, at least in Europe – have long been forsaken. Here, chain reversal, self-assembled teaming and self-scheduling by all kinds of ways of self-organization are called ‘referendum’ . A discussion has also already started on Science 2.0, past the ratio, which, besides objective knowledge from the rational scientific worldview, also integrates subjective knowledge and our ‘inner world’ and intuition in the scientific methodology we use to view reality. Annick de Witt and Erasmus University’s Professor Arjo Klamer contribute to this discourse. Klamer hopes to make scientific thinking on ‘the good society’ possible again. . When looking at the whole picture, you will see that, just like recent technological developments which have reached the ‘mass public’, digitization, Web 2.0 and the semantic web have an impact which touches upon many scientific disciplines and many facets of life: economics, psychology, sociology and anthropology – just to name a few. These developments have enforced a new environment where old rules have fallen away – regardless of whether this concerns separately organized university faculties, the country’s State secretaries or the departments in a business corporation, the latter development usually called Business Process Management (BPM). This essay attempts to make part of this impact visible and to show that a new paradigm shift has taken place in politics, business and science and re-defines the various realms. The recent technological innovation which had a similar impact, I feel, was the introduction of the pill in the 1960’s. That development was also paired with entirely new social structures and changed our way of thinking. It was also a long-term process accompanied by many, even ongoing debates after 50 years. The Internet increases our skills in both creativity and reactivity. In both ‘roles’, the web takes on the function of an ‘organizer’ of collective intelligence, just think of Google and how they are digitalizing books. The Internet stimulates the reactive ‘work and life administrator’ in our selves. The ‘work and life administrator’ likes to document all information, wants to neither lose nor miss anything, constantly reflects and leads, for instance, to a plurality of sensitive documentations of our behavior in public. The Internet offers the opportunity to react, which ubiquitously takes place simply because there is so much to react upon. In this reactive mode of behavior you will live from ‘outside’ to ‘inside’ and in this reactive mode actions such as optimizing, adapting and copying are necessary. For the business realm, this is the world of control and ‘best practices’ – a world of ‘scientific management’ in which one is trying to meet the future on the basis of past experiences and with the aid of science, taking into account all risks which can be thought of right now. This is also the world of scenario analysis. On the other hand, the Internet stimulates creativity and makes us life designers. It will become easier to find other people so that together, you can accomplish your dreams. This is the world of networking and working together from the inside to the outside. This refers to the ‘creator’ in us. That is the world of the individually operating (work)-entrepreneur, a fast growing community in the Netherlands of 800.000 entrepreneurs now, a substantial part of the Dutch labor market. Information from the Internet does not only make it easier for us to reflect by using the web as a lifetime archive. The Internet also allows us to explore new possibilities, new opportunities and make new combinations. In creating the digital world, forming new networks as an individual to start new initiatives from a new point of view – inspired by and connected to the vicinity – is easier and cheaper. This requires people who from the comfort of their own environment dare to read from the ‘inside’ to the ‘outside’ in a learning curve. We think that this ‘creating’ point of view houses the source of the union of digitalizing information on the one hand and the ever increasing interest in spirituality and personal development and healing trauma on the other side : Here, the Internet serves as a tool that supports shaping your own life, where you take responsibility for your own choices. Nowadays, we will probably need both, as a human being, as a business and as a country. As always, it is the art to find balance and to strike the golden mean. However, I feel the future is in our region in the creative viewpoint as it honors human beings as creators that express themselves. Our reactive way of thinking is strongly determined by habits, patterns, assumptions, personal frames, fear of rejection and by positive as well as negative reactions of our environment. However, daring to create means letting go of formalized, external certainties, letting go of thinking from within the boundaries of the already existing, and to dare to stand on our own feet, amongst others by being aware of your own talents, ways of thinking and patterns. I think that the Internet is making our world so flexible and dynamic, so open and ‘perpetual beta’, that external certainties are fading ever increasingly. Indeed, tomorrow will be ‘different’. Parting from thinking from within boundaries also allows you to redefine your own business as a part of a greater whole and part of an eco-system. This allows you to make your orientation wider, more integrated or, should you wish to use this word, more holistic. To cover this perspective on life and work, Peter Senge et al. introduced the term ‘presence’ . With this term, the authors describe the choice for a conscious participation in a greater field of change, in which unbiased people are open to ideas by others. Is stepping out of your own frame of mind hard for you, or is it refreshing? Allowing different perspectives at least means that your approach to a problem is a systematic one, using different – predetermined or not – angles. You make the step from linear to or cyclical, non-linear thinking. An example of letting go of linear thinking can e.g. be found in the cyclic innovation model (CIM) by Professor Guus Berkhout . We have started with linear thinking and set patterns, and by increasing the amount of perspectives we are getting closer and closer to holistic or integrated thinking . An example of what a change in perspective can yield can be seen in the company AVR. AVR (Rijnmond Disposal) in Rotterdam has stopped seeing itself as a waste disposal company and has redefined, re-designed, itself as a supplier of natural resources and power. In short, it has created a new perspective of itself. Of course, AVR will continue to dispose waste. But it also puts itself in a much wider and new context. AVR has internalized its own value by means of this reorientation. By doing so, the new enterprise is unfolding itself in the new phase of an ever deeper learning experience. This will also lead to a different review of the economic value of AVR. Is your goal to prevent past mistakes? That is the reactive point of view which many enterprises tend to opt for these days: paying attention to ‘best practices’, efficiency, using enterprise resource planning (ERP) software, market research and business Intelligence including CRM and VRM (‘vendor relationship management’), Sarbanes Oxley (SOX) , control orientation and company ‘best-practice’ comparisons. The point I am trying to make is that this is just one out of more than a hundred possible perspectives. Using this outside-in point of view, an enterprise puts the path to be followed outside the company – effectively rendering itself ‘reactive’. As something from the company’s outside is made reference for one’s action the company’s soul is lost in the end and the enterprise will be nothing more than the executor of tasks invented by others, taking a distrustful and reactive stance in the world. It is being led by the market and does not create any new markets itself. There is no ‘real design’ anymore. There is nothing wrong with that and it does make quite a penny nowadays. Such a company will use the Internet as a librarian would use his library. Driven by the will to survive we see a focus on smart searching and combining, but with a strong tendency for closed, well ordered mental systems, reflecting and risk management. Do you recognize it? But what if ‘outside’ is increasingly less fixed and offers fewer securities? What if China arrives and forces us to reduce our overhead by 70% in five years’ time? Surely, everything which is transmitted by wire – which is constantly getting more bandwidth – has to be able to compete with China, Singapore, the Philippines and Vietnam. What gives you a grip in the fast, flexible digital world where every day is different? Do you dare to have confidence in yourself? What’s the basis of a ‘blue ocean marketing’ strategy, a new direction coming out of the blue? Another point of view is that of the Internet is inviting you as a merchant or ‘work-entrepreneur’ to stay by your own wares. Next to outside-in, inside-out appears as a new perspective. A perspective which in my eyes triggers your most powerful competencies. This is true for you and me, for individual employees and departments, but also for enterprises and states. 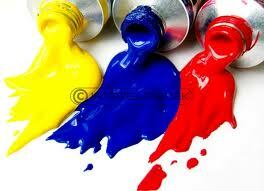 By thinking inside-out you activate creative and entrepreneurial skills within the organization. Then, you are not interested in best practices and fast follower behavior. You opt for next practices and determine your own choices and activities. You have the entire world at your disposal when finding an answer to your questions, this being empowered by, for instance, Wikipedia. You give shape to your own life: it is your move. You prospect and think in open systems and most likely use open source software, social media and wikis to keep track of others within the organization. From this point of view, you can give, without having the feeling of giving something away or losing something. You see cooperation as a core-competency. Who is your ‘pal’? With whom do you pool, ally and link? E.g., how do you perceive the subject ‘privacy’? How do you think about that? And what is your opinion on the protection of privacy? Is privacy – and with that, the Internet – a source of potential terrorism against which appropriate matters need to be taken? Or is privacy a commodity for which you are willing to pay a price, a ‘dissident tax’, and should censure on the Internet be prevented? I think that your opinion on the Internet is the verdict on your values regarding privacy. Do you recognize this? The Internet and the digitizing of information create renewed attention for values and norms in both the public and private sector. No growth without roots indeed. This is true for the economic development of enterprises in terms of their power to earn. But also for our personal development as human beings. Heavy growing requires strong roots. So what are our roots, or, stating it differently, our values? And do networks and digitizing our world have an influence on that orientation of value? Is it going to shift or is the Internet only making us more conscious of it because it is becoming more and more explicit to us? Has being an entrepreneur become a different trade due to the Internet? What does the Internet do to our values and how do we position the Internet from our values? This is a completely new and fascinating (digital) anthropological academic field. As a metaphor, we could look at the Internet as a very large ‘media center’: do you decide the show, or are you being led? With the focus on individual, own value, more societal diversity will start to exist. Where will that lead to? I do not know. More trust in society, or perhaps less? Will society become more tribal? It sure is captivating! When looking at figure 1, we can see two heartbeats, react and create, back in the ‘counter’ and ‘en-counter’ quadrants. 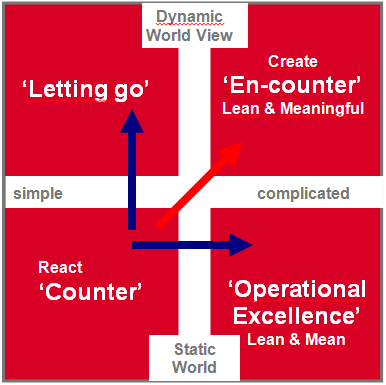 In the counter quadrant, people chose for boundaries, adapting to existing frameworks and to management, command and control as a mechanism of coordination. In business context, you will essentially survive by means of camouflage: within the organization, you are but your job title. It is not relevant who you are. 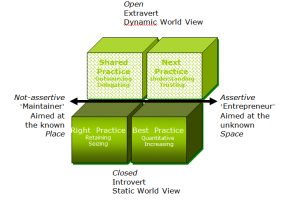 In this quadrant, the lasting invitation is to adapt to ‘the company’: “this is the way it is”. That is reactive. This is the world of certificates: ’that is how we do it here’. Jaap Peters and Judith Pouw speak in their contributions of ‘intensive human-husbandry’ . In this sense, the Internet is being used as an effective distribution tool for information. Solutions within the ‘counter’ quadrant are often characterized by division of labor and as such, by compartmentalization, which results in an environment in which no one is able to really take responsibility, just because there is no responsibility or perhaps only in abstract terms. Everyone is optimizing his own part and there is no one who oversees the whole or even cares about doing so. Hence, cooperation becomes a challenge and, unfortunately, often results in striving for parallel self-interest and ‘every man for himself’. This is the world of mental processes, winning and competition, and the survival of the fittest: eat or be eaten. The land where linear thinking is king: how do I navigate myself, or my ‘compartment’, as neatly as possible from A to B? This often leads to a fragmented approach. ‘To counter’ is the way in which most, approximately 65% in the Netherlands, enterprises and governmental institutions are still being organized. Control excellence and operational excellence, focusing on stability, lean & mean (TQM, Lean Thinking, and Six Sigma) tend to reduce costs; in fact rendering past mistakes good. • To en-counter means that enterprises and/or individuals organize themselves in changing virtual communities in order to supply a rapidly changing market demand. The basically inside-out direction of improvement is by building a new giant within and between enterprises: communicational excellence. The outside-in world is basically reactive. This outside-in world is basically one of camouflage as this is the individual survival strategy which is so characteristic for our reactive mode of consciousness. This is the world of control, job titles and rule-based behavior, the world of ‘right practices’, implicitly but basically aimed at avoiding personal responsibility. You may rise in the world of inside-out en-countering. En-countering means that enterprises and/or individuals organize themselves in changing communities as lean & meaningful network organizations in order to supply a rapidly changing market demand from inside out and to create their own markets. Here is e.g. the so-called ‘blue ocean strategy’. The individual survival strategy here is not camouflage and adapting anymore. This strategy here is one which plays to your strengths. This strategy requires personal commitment and a ‘coming-out’ from camouflage. The creative mode requires you to take a stand in life, to leave the safe harbor and to embark on your business life’s journey. Of course stormy weather may be part of this journey….. But that’s how it is. Practical market examples of en-countering and open solutions where the market has replaced hierarchy are, for instance, www.unitedconsumers.com or http://fearlessrevolution.com/common/ and many other websites for marketplaces. This list also include www.smava.de, www.prosper.com or www.zopa.uk . As examples of P2P banking. The Dutch www.noppes.nl is a neat example of a business facilitating communicational excellence and barter with social currency, the lets, facilitating ‘nearonomics’. Creative commons is an open way to deal with innovations. Social media like twitter will speed up this process of community building and may allow for serendipity, bringing the right people together to do the job. Many individually operating entrepreneurs work like this. The survival strategy here is no longer camouflage but ‘standing up’, a new way of working and human driven processes, showing who you are, resulting in survival of the most cooperative. The basic driver of cooperation is always sharing and giving. We shouldn’t forget that . We can also illustrate this schema by means of figure 2 (see below), in which the indicated distinction between open and closed as well as assertive and non-assertive personalities matches with the Jungian subdivision of personalities (open versus closed and an assertive versus a non-assertive character), reflecting his vision that all the living is energy and therefore reflecting polarity, this polarity being so characteristic for our time. The word ‘place’ to the left of figure 2 refers to the confined thinking in the bottom-left corner: thinking within frameworks, within the box. The word ‘space’ to the right of the figure refers to the unlimited thinking in the upper-right corner, out of the box . The perspectives ‘counter’ and ‘en-counter’ follow suit in the same manner: it is not or-or but and-and. Flexible ways of cooperation in the shaping of targeted communities supplement the hierarchy and central control as a mechanism of coordination within companies. I expect Schedule Push will be more and more surrounded by Reality Pull . Large enterprises are increasingly surrounded by smaller ones which have, proportionally speaking, considerable power . Apart from the ethics there is one good reason for this. The internet reduces the cost of creating cooperation with at least 50% as compared to the hierarchy as a means to facilitate cooperation. Speaking in terms of the underlying orientation of value, it appears that the individual competences and honest and integral way in which someone perceives these opportunities and communicates about this are gradually more important for success in this world in which there is so much mobility. Authenticity, credibility and consistency in personal actions, as well as the focus on one’s own strengths will set the tone. Anselm Grün states that knowledge of oneself, knowledge of human nature, creativity and fantasy are prerequisites for leading, which starts with leading yourself . As such, business development, personal development as well as ruling the country is about points of view and how one can perceive, for instance, business, social networking, science and politics from many different yet equal perspectives, reactive – the manager – or creative – the entrepreneur. I invite you to take and understand a different point of view once. To understand yourself, your colleagues within the corporation, your friends, your children or anyone else. I think that our capability of understanding is exactly what makes the difference between growing into compassionate capitalism with mutual respect and a piranha economy in which everyone competes with each other. To see more sides of the story, for instance your competitor’s side, allows for true communication and generates mutual respect. The Internet really allows you to make your personal move introducing ‘the personal age’ and shows you who you are and really makes everyone a life designer! Exciting!